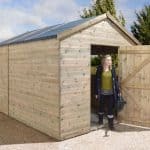 The 10′ x 6′ Traditional Standard Pent Shed from the Treetops Traditional line of sheds is offering you plenty of room to keep a number of different items safe and sound from our harshest weather. The floor space available to you is pretty amazing and thanks to the height of the shed, you could even put some shelving in to greatly maximise your storage space. The shed has a truly fantastic look which can be customised by you as you decide what style of door you want, where the door goes and how many windows you have. This is a shed which you can actually have a bit of input when it comes to the way it looks which will make you love it even more. No matter what style you decide to have the shed in. 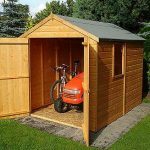 One thing that is for certain is your shed will be built using some very top quality materials. Tongue and groove shiplap cladding is used for the walls. Even the flooring and the roof have been made with tongue and groove boarding which provide incredible strength and well as a great look. Along with the roof boards and the flooring, the frame is also very strong and made with some high quality redwood to ensure the shed will be standing strong and with pride in your garden for a very long time. With a very high quality look the 10′ x 6′ Traditional Standard Pent Shed is the perfect way to solve any storage problems that you have. 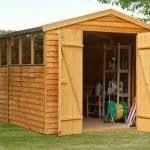 From figuring out where to keep all of your tools to the kids finally having a reason not to just dump their bikes and toys on the lawn, this is one very nice looking shed which is ideal for gardens of many different shapes and sizes. The width is right around 10 feet and this is where most of the space in the shed is. 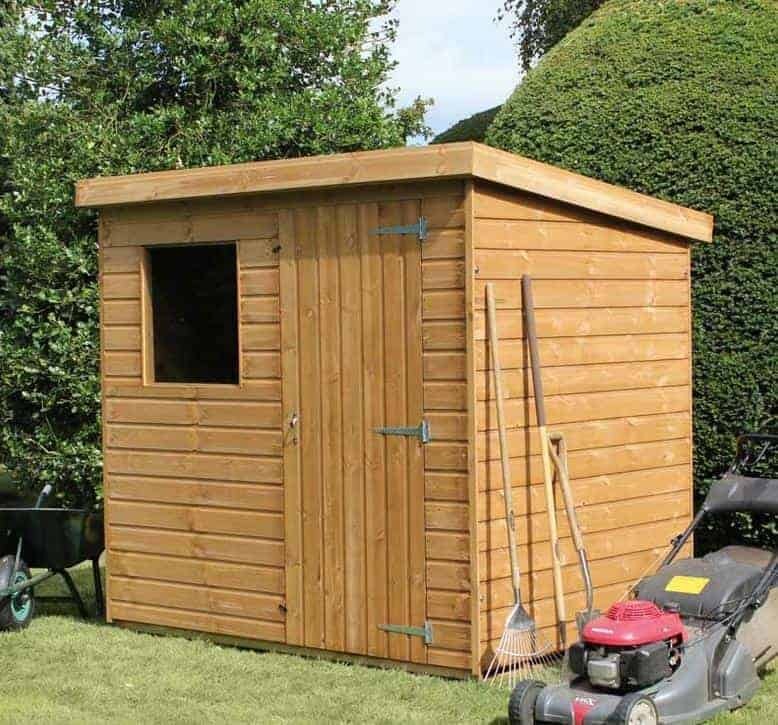 The fact that the depth is at the 6 foot mark means that this shed while offering quite a lot of space, because of its dimensions could fit into smaller gardens. The height in the shed was far more impressive than we thought it would be. The highest point of the shed is a little over 6 feet high while the lowest point is 5 feet 11 inches. The roof is a pent roof which is actually quite rare for a Treetops Traditional shed to have, but we actually really like it as we feel it does make this shed stand out from the rest and of course a pent roof always does a wonderful job at keeping out the rain. The roof is made up from some 12 mm tongue and groove boarding which is then covered by roofing felt to give it some heavy duty protection. While Treetops Traditional have changed things up with the roof they have stuck with their amazing and tried and tested 12 mm tongue and groove shiplap cladding which we love. This cladding has such a good look to it that it honestly makes the shed look like it should cost a few hundred pounds more. As well as having a very appealing look, the cladding also is pretty much water tight and will not allow any water inside, no matter what direction it is hitting the shed from. The frame is made with some very top quality redwood, actually this type of wood is used throughout the shed, but it really is perfect for the frame as it is a solid type of wood. The frame is a very impressive size at 44 mm 27 mm. We are very confident that this frame is going to stay solid for many years. One thing that we love about this range of sheds is the way the edges of the frame is rounded which makes the inside of the shed look that little bit better. We think that the Treetops Traditional sheds always do a fantastic job when it comes to the floor and that is true for this shed as well. The 12 mm tongue and groove boards which are used under the roof is what they have chosen for the flooring and they really do feel strong under your feet. Too many sheds cut corners by having a cheap and bouncy floor, we are very happy to say that, you will be very happy with the quality of this floor. The shed will be given a free coat of treatment to see it through delivery, installation and even the first few weeks of its life. However, you will need to give it another coat within six weeks to protect the wood. We always suggest giving it your own coat much sooner than later. To help the wood stay in great shape, you will need to treat the shed each year. Like the other sheds which are in the Treetops Traditional line, the 10′ x 6′ Traditional Standard Pent Shed Treetops Traditional comes with a one year guarantee. The default door that comes with the shed is a really good size so you will have no hassle getting things inside and out again. The door is a very nice 2 feet 6 inches wide and it is held in its place with some very heavy duty door hinges. When you order you can actually request that a stable style door is used instead if you want to change the look a little bit. When ordering you can actually say exactly where you want the door to go on the shed. There are actually an incredible five different positions that you can choose to have the door so have a really good think about where you want the door to go before you order. The shed in its default style comes with three horticultural glass fixed windows. These windows are made to a very high standard and for an extra, £31.99, you can have it so one of the windows can be opened. The amount of windows that you have on the shed will depend on where you place the door some door placement positions will not allow for all three windows to be included. The shed comes with a lock and key which is perfect for you people looking to keep more expensive gardening equipment or even bikes inside here as you will be able to keep things locked up safely during the night. When it comes to privacy to be honest with you it is all down to how you have the door and the windows. In the sheds default design those three windows do make it easy to look inside and see what there it, but with a different window placement or even selecting to have no windows at all then you will have all the privacy you could want. 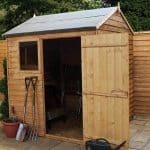 We have already touched on the different ways that you can have the doors and windows on the shed, but another way to give the shed your own little touch is with the wood treatment. Wood treatment can be bought in many different colours so pick one that you really like or that goes with the rest of your garden to make the shed fit in even better. There are a few extras available with the shed. To start with the door for a price of £53.99 can be upgraded to a 4 feet wide double door. Also they offer a set of floor bearers at £40.99. These would be worth considering if you have any concerns over the ground you are building the shed on. We are very happy with how this shed has come out and are sure everyone will be happy with the overall quality of the shed. This is a hard one to score as honestly this shed could last you forever as long as you look after the wood by treating it annually. The materials are designed to last for a long time, but you do need to help them out a little bit. 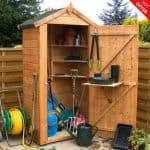 Even though most of the space is available is in the width, this shed still has a lot of space for you to make use of. The shed comes with fairly easy to follow instructions and to be honest it is rather straightforward. As long as you take a break for some tea and maybe a slice of cake, you will find the installation and enjoyable process. We love how this shed has turned out and think that at £599.95, you are getting very good value for money. 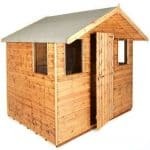 The size and quality alone make this a shed which is offering a lot for a very reasonable price. 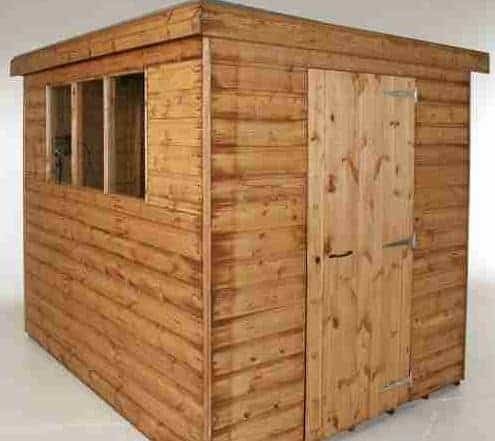 Final Thoughts: The 10' x 6' Traditional Standard Pent Shed really is quite an incredible shed. Even when you take it in its default form, you are getting a really awesome looking and very practical shed that is going to be something that lasts for many years thanks to the materials which have been used. The fact that they allow you to make so many changes to the shed and have a little input on the way it is designed is something that is really cool and a way to make sure you are getting a shed that is just perfect for your own personal taste.